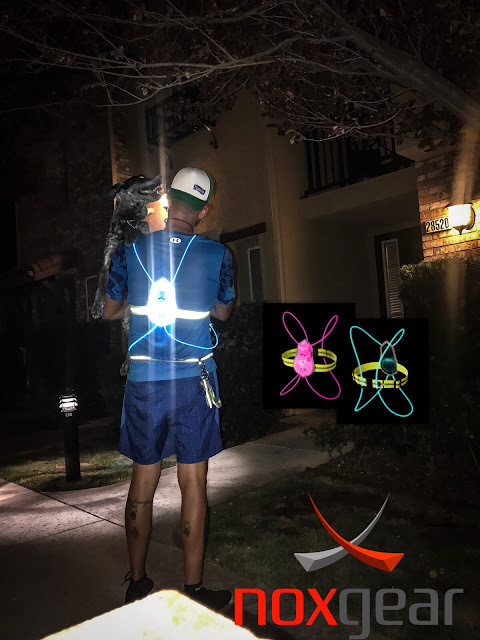 NOXgear have designed a fully visible light up vest for any athlete training in those early mornings, or late nights with one thing in mind, Safety. After placing my order with NOXgear, my vest arrived quickly within a few days and I was excited to test it out. Currently I have been running at night in Southern California on a shared pathway which is not lit at all. I have been looking for something just like this as I wanted to be seen as not to get runover by passing cyclists or vehicles. 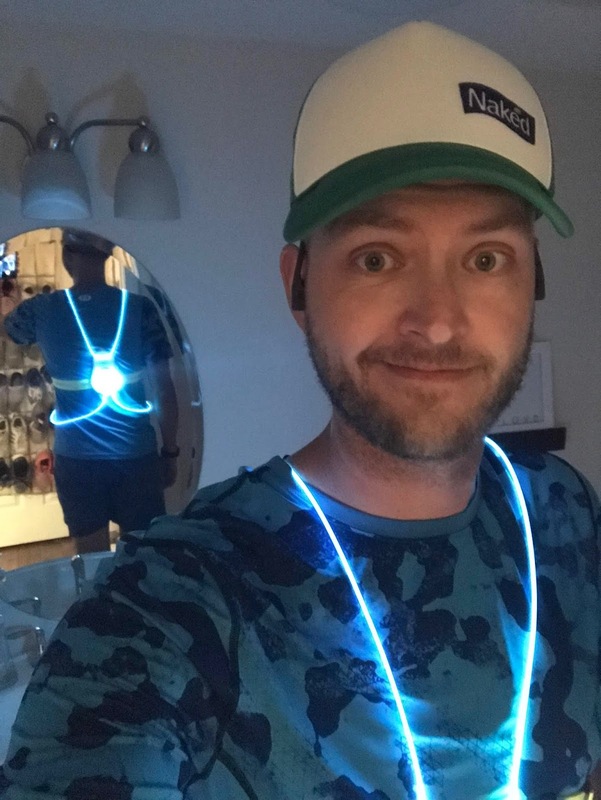 The vest is perfect as I don’t need to hold external lights when I run. The vest arrived in a great looking designed box with batteries already installed. I mean, come on. Now a days how many items come without batteries and have you scrambling to steal batteries from your tv remotes or kids toys. This was a huge benefit and it’s all in the small details. The unit itself is powered by 3 “aaa” batteries and boasts a life of 40 hours. Running 40 hours of darkness should be ideal for any person no matter what race you are tackling. To fit the unit on your body, you place the light up base securely on the center of your back, while an adjustable reflective harness belt fits around your torso. 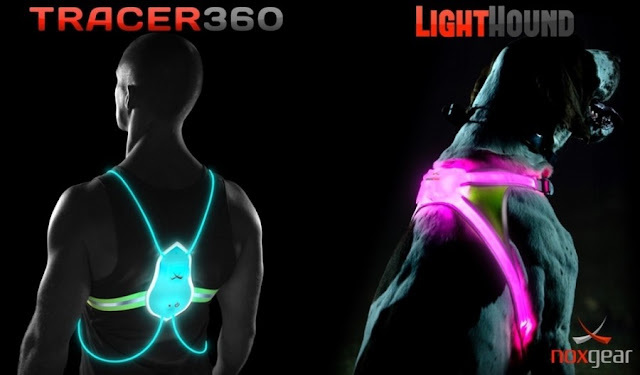 The unit is complimented by clear cords that transmit light over your shoulders, and back around your waist for a truly 360 degrees of light emulation. The fit is easy to customize and I found that the lower I placed the reflective belt, the better the fit was for me. I’m over 6 feet tall so it may depend on your body type and preference but can easily be adjusted mid-activity. Within steps of wearing the Tracer360 vest, you won’t even tell that you’re wearing anything at all. The entire ground behind me was lit up and the fear of being seen was no longer an issue. The unit is rainproof, and with hours of sweaty testing, I have not noticed any issues with performance or functionality. Let’s talk about customization. I’m someone who loves to match my fitness outfits. 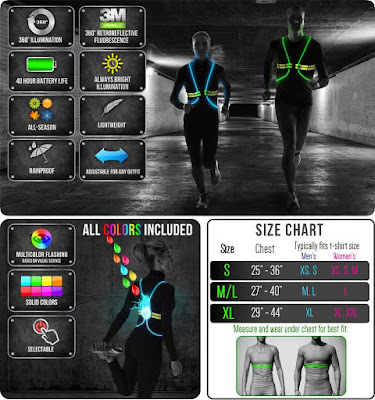 Be it my cycling gear or my running attire, NOXgear has designed this unit to adapt to your favorite colors with a selectable color pallet. 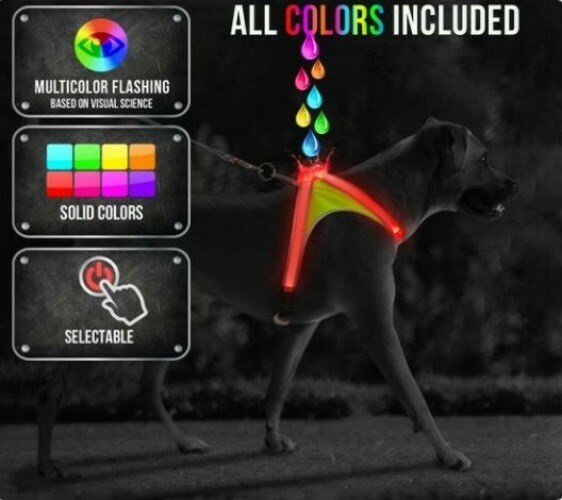 You can chose between 8 colors to have a solid light of your choice, or chose multi-color flashing for maximum visibility. With 3 sizes for both men and women, there’s a vest that’s right for you. Now it’s time to talk about the unit itself, and what powers it. 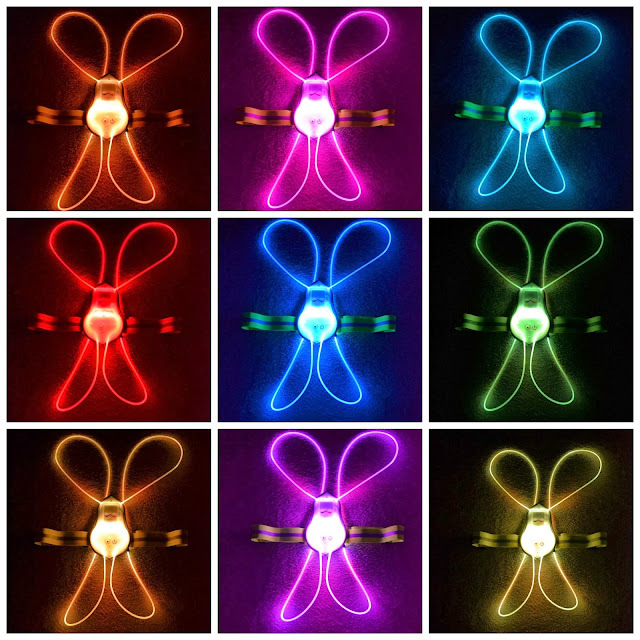 This unit although super light, is constructed to stand the test of time. It’s powered by 2 Cree bulbs that provide 40 lumens that travel through fiber optic cords around your upper body. 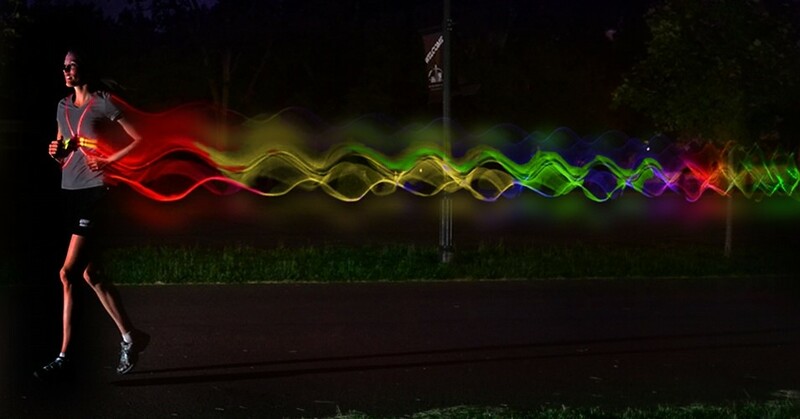 The glow from the cables and the pack which is secure on your back can be seen from over a mile away in any direction. It’s completely weatherproof and can be enjoyed in extreme heat, severe rain, or racing to the North Pole, if that’s your thing. Being fully adjustable, you won’t have to worry about wearing this over a sweater or jacket, as it can easily be adjusted to fit a number of different sizes within your ordered vest size. With the use of fiber optic cables, the entire unit weighs in at only 7.0 ounces, and mentioned before, it feels like second skin. The reflective strap that secures the unit around your torso is sweat resistant and has 3m retroreflective fluorescent scotchlite to add to its visibility. 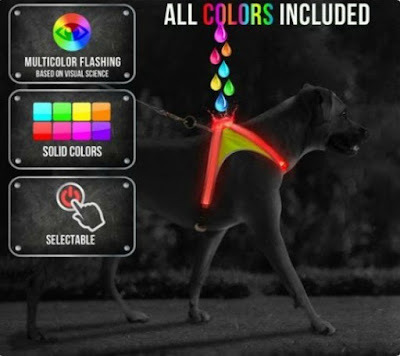 NOXgear also has a LightHound version so your pooch can stay safe which adds more visibility to your activities.